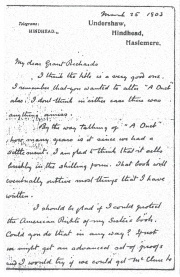 This letter was written by Arthur Conan Doyle on 25 march 1903 from Undershaw, Hindhead, Haslemere, to his friend and book publisher Grant Richards (1872-1948). I think the title is a very good one. I remember that you wanted to alter "A Duet" alas I don't think in either case there was anything amiss. 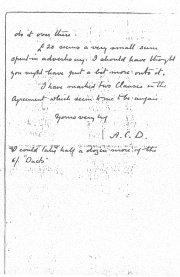 By the way talking of "A Duet" how many years is it since we had a settlement. I am glad to think that it sells briskly in the shilling form. That book will eventually outline most things that I have written. I should be glad if I could protect the American Rights of my Sister's book. Could you do that in any way? If not we might get an advanced set of proofs and I would try if we could get McClure to do it over there. £20 seems a very small sum spent in advertising. I should have thought you might have put a bit more onto it. I have marked two clauses in the agreement which seem to me to be unfair. I could take half a dozen more of the 6/. "Duets". This page was last edited on 31 July 2017, at 22:25.